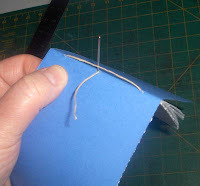 This is the most basic bookbinding technique; it is called a 3-hole pamphlet stitch. 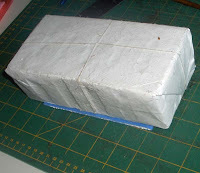 If you’ve ever taken any sort of bookbinding class, then you probably started with this. It is a simple sewing pattern that can be done very quickly and it is very effective for binding a small number of pages. Great for handmade greeting cards, invitations, or small collections of poetry! 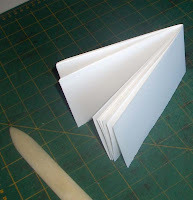 So skipping the elements of proper paper folding, ripping, grain direction, etc....let's start bookbinding! I have about 8 strips of paper for my notebook. 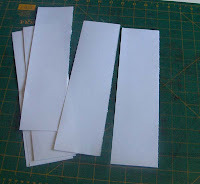 And I have cut a strip of blue card stock for the cover, the same size as these strips of paper. So I gather them up in a neat little pile, then fold them in half. 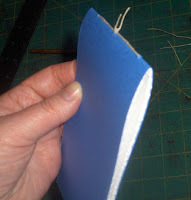 Then I fold the cardstock over the pages and mark 3 spots on the spine for sewing. I’m skipping a standard step here about preparing a sewing jig…for this little notebook I wouldn’t normally measure or plan the holes at all, but I have marked them so they’ll show up in the photo. Anyway, poke 3 holes through the spine; one in the centre and then two others evenly spaced on each side. It is easiest to poke the holes from the inside. I have a thin awl for poking holes, but you can use a needle too. Now you need a needle with some thread on it. 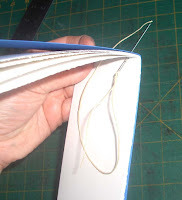 I’m using waxed linen bookbinding thread…but use whatever. Full strands of embroidery floss are about the same thickness and my thread. Now on the inside, put the needle through one of the other holes (don’t matter which one) and pull it all the way through until it is snug (but make sure you don’t pull the tail through). Now with the needle back on the outside, put it through the last hole (the only one you haven’t used yet) and pull it all the way through until it is snug. Now the needle has to go back through the middle hole. Don’t pierce the other thread that is already through this hole (if you pierce the other thread then you won’t ever be able to tighten the sewing, so don’t do it). Pull the needle and thread all the way through until all the sewing is snug. Before you tie a knot, make sure that the two ends of your thread are on either side of the thread that is along the spine. 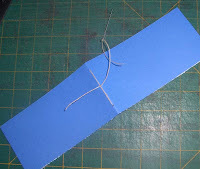 Make sure the thread is snug on the inside and the outside, then tie a square knot (right over left, left over right). You can do whatever you want with the ends of the string – cut them short, or make a bow, or attach shells and feathers if you wish! 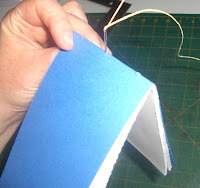 If you don’t like the ends of the string hanging on the outside of your book, just start on the inside of the fold. 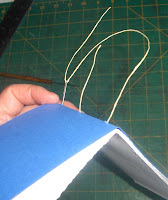 When you do that, you will also end on the inside so you can trim the ends of the string short and the knot will be hidden inside your book. I just cut them short here. And that’s it. A notebook! Yay! Oh, then I dropped a brick on it. I’ll leave it under the brick overnight. 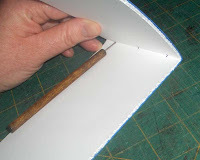 That will compress the folded spine so the notebook will lie flat, rather than swollen. In a few weeks, I'll explain how to make a notebook using a chopstick. I can't wait to try this with homemade cards. I love to make cards with my friends, but they just pile up. However, I'll make booklets out of them, use them, resew new pages when the old get used up! And Nancy, that`s great, thanks for telling me!! So cool! I can't tell you how glad I am that I found your blog!